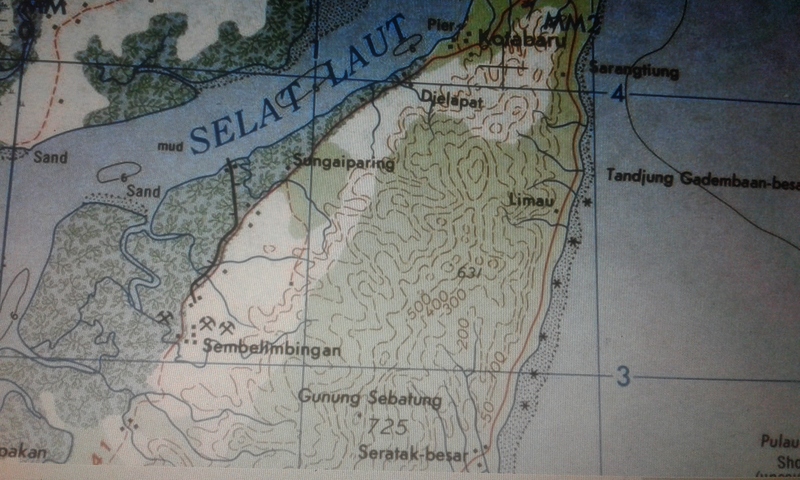 Less a single mountain and more a large, low range, Gunung Sebatung dominates the northern half of Pulau Laut (‘Sea Island’). Despite the name, Pulau Laut is certainly not an ‘island of louts’ – the local people are very friendly and there are plenty of activities to do here to make it worth your while visiting a large island off Borneo that sees few tourists at present. Assuming your flights are not delayed, it is just about possible to fly to Stagen airport which serves the main town of Kotabaru, go for a hike, and return again to Jakarta (or elsewhere) in a single weekend. According to both Google Earth and old US military maps, the highest point of the island is about 725m and lies just a few kilometres inland from the airport. Alas, at present it would appear this top is seldom if ever visited and so reaching the highest point is likely to be a considerable expedition requiring several days and the creation of a trail. It might be worth asking in Sebelimbingan (on the west coast near the airport) or Teluk Mesjid (on the east coast). However, the northernmost significant hill of the range is climbed several times a year by local student hiking groups and nature lovers. If you ask anyone about hiking Gunung Sebatung they will likely tell you about this peak rather than any of the less-frequented parts of the range including the true (slightly higher) summit. Not only is this northern top very close to Kotabaru town, it also has a trail which is – for the most part – straightforward. Despite its modest height of around 704m, it looks rather shapely from the town too. 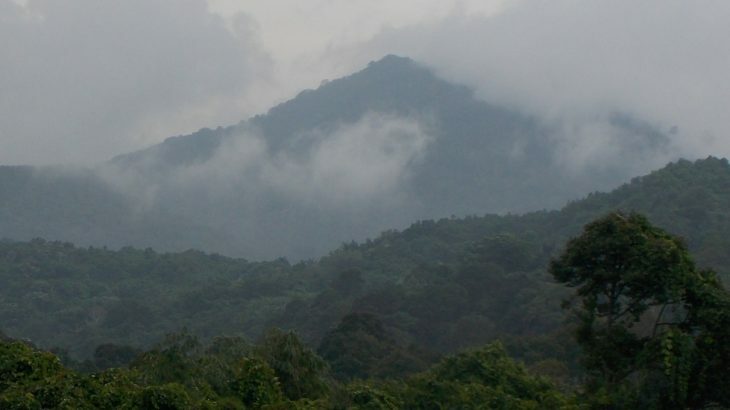 Whilst this northern top is known as Gunung Sebatung to local people, it is also known as Gunung Bamega (‘cloudy mountain’), Gunung Sa-ijaan (a local motto word) and ‘Puncak Bendera’ (‘flag peak’). The latter will be used from now on, in order to distinguish between this northern peak and the slightly higher true island highpoint which is a good 8 or 9 kilometres further south, and also to pay tribute to the local students who hiked to the top in August 2013 and made a giant bamboo flagpole and flag. The flag could be seen above the treetops in the town of Kotabaru and, although the flag itself is no longer there, the impressively huge bamboo flag pole remains in place. There are a couple of potential starting points, but the best quality trail starts in Desa Tirawan (70m above sea level). Your guide may take you 2 kilometres off-road by motorbike along a farm path to a junction where you need to take a right (90m) in order to save 45 minutes or so of walking from the main road. From the main road to the peak should take hikers a maximum of 3 and a half hours (or under 3 if you get a ride 2km in) and less on the way back down. It could therefore be done as a day-hike, but you might consider camping up there as there are some suitable spots on the summit ridge. From the junction where you take a right, it is less than 15 minutes to a pleasant stream (190m). Another 30 minutes and you should be at a flat area previously used for camping. This is an important junction, and is also the point at which you are most likely to become lost. A left turn on the clearest (in 2017) trail leads to Gunung Gundul (a 30 minute walk apparently, and perhaps around 350m high). A right leads up to Puncak Bendera (Sebatung) but you need to take a left just beyond a nangka tree (380m). This left should be marked with a lightly spray-painted stone and is not the first sharp left. The correct trail at this point becomes rather tricky, with a very steep, muddy, slippery section of giant bamboo vegetation. The views to the coast from here are quite good, but after rain it is almost impossible not to fall all over the place, especially if you are carrying a big backpack. Next is a rocky area known as Batu Dua (550m), and finally you find yourself on the main summit ridge. First is the huge bamboo flagpole, then just beyond a camping area large enough for at least 5 or 6 tents (approximately 695m). You can just about make out the ocean between the trees, and you will probably hear the sounds of various large cargo ships as they pass by. Most hikers do not venture beyond this spot but there are two further little tops just 5 minutes or so beyond the camp area which are likely to be over 700m in elevation. First is Menara HT (HT Tower), where bits of old metal tower remain, slowly decaying (approximately 704m). A further two minutes beyond this is an unmarked little bump which is around 702m. It would appear from GPS readings that Menara HT is the highest point of this northern top of Gunung Sebatung, which we are calling Puncak Bendera to differentiate from the true high point of the island which lies a further 8km or so further south. One provincial map has a peak called Gunung Mando (662m) marked somewhere on the extensive backbone mountain range between Puncak Bendera and the true highpoint of Sebatung, but there is almost certainly no trail at present. It is warm enough to sleep in a hammock here, but be aware that rain is common and leeches fairly common too in wet conditions. In dry weather, you will be able to enjoy listening to the majestic cicadas at dawn and dusk. There are also hornbills and black monkeys in the area. If the weather is good and you have a couple of hours spare after descending from Puncak Bendera, nearby Gunung Mamake (224m) is an easy 30 minute stroll and, being non-forested, has some great coastal views and is especially popular at sunrise and sunset. In the southern half of the island, which is apparently better than the north in terms of beaches and diving opportunities, is the iconic Gunung Jambangan, under 500m in elevation but probably offering some good views along the coast. Getting there: The true highpoint of Pulau Laut is less than 8 km from the airport runway at Kotabaru . 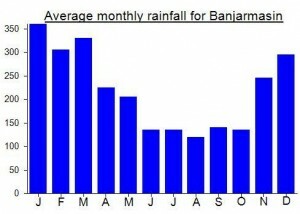 There are usually at least 2 flights a day (either from Banjarmasin or Makassar). The most commonly hiked peak near Kotabaru itself is also very close (9km in a straight line) and the trailhead at Desa Tirawan takes less than 30 minutes ot reach by car or motorbike. Accommodation: A couple of hotels in Kotabaru itself. Permits: Not required but best to take a local guide and let villagers know when you start your hike and when to expect you back. Water sources: Available at the river less than an hour from the trailhead – but it is best to take your own. Featured, Kalimantan Selatan Spesial. permalink. I tried to find someone who knew about the true highest point of Pulau Laut but got nowhere… it may be the case that nobody has hiked to the top in decades. I did however find some very pleasant folk to accompany me up the northern ‘bendera’ peak near Kotabaru itself. Good hike, and great excuse to visit Pulau Laut. Saw a small Banded Malayan Coral Snake (calliophis intestinalis).